Whether you're cleaning up to get ready for a road trip, or after you've made it back home, this handheld vacuum is perfect for tidying up your vehicle. Simply plug the cord into the car's cigarette lighter and it's ready to get the job done! The 15 foot cord is perfect for large SUVs and vans. 100 watts of power paired with the 3000Pa robust suction picks up pet hair, dirt, debris, crumbs and other small particles with ease; the extra brush head helps with scrubbing. The lightweight vacuum also includes an interchangeable HEPA filter that better filters smaller specks. 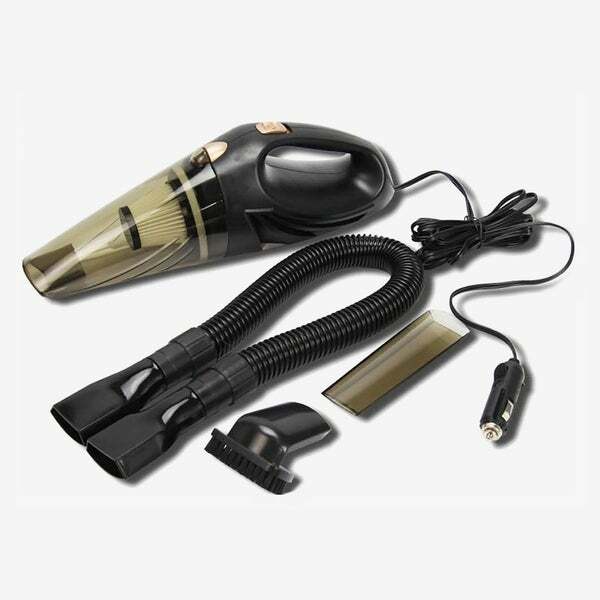 This lightweight and durable car vacuum picks up pet hair, dirt, debris, crumbs and other small particles with ease. The perfect companion for road trips; use it in small cars, SUVs, or vans. Includes (1) car vacuum, (1) built-in HEPA filter, (1) soft pipe, (1) brush head, (1) common head, (1) carrying bag and (3) pins. Voltage: DC 12V, Power: 100W, Suction: 3000Pa, Cord length: 15 feet. Materials: Durable ABS vacuum, nylon carrying bag, metal pins, plastic brush head and plastic pipe. This car vacuum cleaner works better than any I’ve tried. It got up almost all the dog hair from the seat and floor mats. The long hose and attachments let me get into the small crevasses, and I used the brush attachment to clean the dash. I ABSOLUTELY love this car vacuum. We take our dog who sheds UNBELIEVABLY in our company owned semi truck. We are not supposed to have animals so this is amazing to get the hair and pieces of bones up. Works amazing. ONLY thing I was not happy about was it stated it would come with 2 filters buy only came with 1. I was weary on buying this. But the suction power this little thing has is amazing! Especially good for quick clean ups in the back seat with a little one! Well I paid 25 bucks... and guess what?? I got a car vac that is worth....about 25 bucks. Its a good little emergency vac to keep in the car, but to be honest id rather just use a shop vac and do it better and about 3 times as quick to finish. But for the price Id buy it again. It doesn’t pick up very Well. It’s hard to empty. The air seems to blow out the sides instead of actually sucking anything in. I wish I could get money back on this product! It does have a nice bag to store and some accessories. don't expect to much from this. It had good reviews. And with all the assesories thT come with it you get a lot if bang for your buck. Make sure to check back for the product review after i receive it and get a chance to try it out.